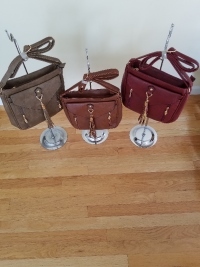 Crossbody purse in choice of 3 colors. Dark red, brown, or taupe. 11H x 12W Zipper main closure and zipper compartment on back. Front opens with a snap for another compartment. Decorative zippers on front that are usable. Tassel on front.